What can fans from countries other than USA join in to celebrate Michaels 60th?? Or is everything going to be wait until next year when its his 10th year of not being with us. Well.......what did fans from outside the USA do, when Michael was alive? They organised their own parties and events, of course. He never celebrated his own birthday in a big way.....his 45th was a fan-organised event (in London) and basically a one-off. His birthday has taken on a different meaning, since he passed away, naturally, but the phenomena of celebrations and events occurring in a limited way, in limited countries (a.k.a mostly the USA, where he was born and where he lived) is not surprising and the same as it's always been. Fan clubs and fan enclaves from other parts of the world (e.g. Brazil) can and will organise their own celebrations, I'm sure. 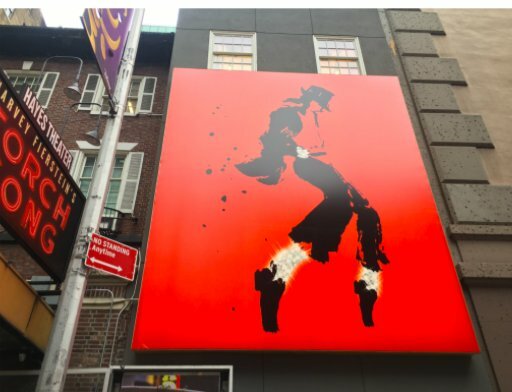 The Estate of Michael Jackson and Cirque du Soleil will host the 6th Annual Michael Jackson ONE celebration in honor of the King of Pop’s birthday on Wednesday, August 29. Join fans from around the world at Mandalay Bay and get ready for a celebration unlike any other! For this year’s very special Diamond Birthday Celebration, the Estate has decided to honor Michael’s well known desire to help disadvantaged people around the world, especially children, by welcoming The Elizabeth Taylor AIDS Foundation to the event. We will join forces to support the work of GAIA Elizabeth Taylor Mobile Health Clinics which brings accessible and free health care to those living in rural Malawi. 8:30 pm – 1 am: Outdoor party at Daylight Club open to ticketholders to both the 7 pm and 9:30 shows of Michael Jackson ONE who are 21 years of age and older. The M. C. of the night’s festivities will be radio personality, Sway Calloway – host of Sway In The Morning, and there will be special presentations and performances by guest stars throughout the party. There will be food and drinks available (for purchase) as well as social media activations inspired by Michael Jackson short films. Sony and the members of the Estate team are very much looking forward to honoring Michael at the Diamond Celebration on August 29 at Mandalay Bay in Las Vegas. For those of you who will be able to join us, John Branca will host a personal, intimate question and answer session just for you, the MJ fans, immediately following the meet and greet held in the Michael Jackson ONE theater lobby. In order to give the chance for people to have a conversation with Mr. Branca, anyone may attend but they MUST RSVP. The location of the Q&A will be emailed the morning of the 29th to the people who have RSVPd. Please feel free to post and distribute this so as many people who wish to attend may RSVP. With a Broadway musical on the way and a guest spot on one of the year’s biggest albums, the King of Pop’s legacy is proving lasting -- and lucrative. When Michael Jackson died on June 25, 2009, the executors of his estate, John McClain and John Branca, felt that their No. 1 job "was to generate revenue, pay off debt and enhance Michael’s legacy as an artist, not the tabloid sensation," says Branca. As the estate gears up to stage Michael Jackson’s Diamond Celebration in Las Vegas on Aug. 29, the day the King of Pop would have turned 60, Branca says that a series of recent deals both large and small are easily taking care of business. This summer, the estate picked up $287.5 million on what sources say was a $50,000 investment as part of the consortium that bought EMI Music Publishing in 2012. With that catalog now worth $4.75 billion, Sony, which owned nearly 30 percent of EMI, agreed to buy out the estate’s 10 percent. Since Jackson put up about $17.5 million in equity and $30 million in debt to buy the ATV catalog for $47.5 million in 1985, the estate, aided by its investment bank Shot Tower Capital, has earned nearly $1.6 billion on that investment, Billboard estimates. Also, given that the estate owns Jackson’s master recordings as well as his publishing rights, Billboard calculates that it earns about $10 million in annual royalties from his recordings in the United States alone, not including synch deals or bonuses that may have been in his recording contracts. Worldwide, the estate earns an estimated $20 million to $25 million a year on the recordings. Helping protect his legacy are initiatives such as the "On the Wall" exhibit at the National Gallery in London that recently opened. "Not everything we do is meant to pull in millions of dollars," says Branca, without commenting specifically on the exhibit. "Sometimes we do things because they are interesting and cool." As for ventures that can accomplish both, a Broadway musical is in the works with Pulitzer Prize-winning playwright Lynn Nottage and renowned ballet choreographer Christopher Wheeldon directing the production. (Cirque du Soleil’s The Immortal world tour and the Michael Jackson ONE tribute in Las Vegas are ongoing.) The estate is also gearing up to release limited-edition sneakers, after a Michael Jackson collection from skateboard brand Supreme immediately sold out earlier in 2018, according to sources. Jackson is also currently on the charts as a featured artist on Drake’s "Don’t Matter to Me," which counts 107 million on-demand streams as part of the rapper’s blockbuster Scorpion album, according to Nielsen Music. All told, the estate’s executors have brought in over $2 billion since Jackson’s death, leaving the estate debt free and all paid up on taxes -- though a decision in a case prompted by an IRS lawsuit over the valuation ascribed to Jackson’s image and likeness is pending, sources say. For now, says Branca, "we’re trying to do things that are smart and tasteful." This little video shows us what the new picture discs (LP vinyl records) released by the Estate, for Michael's Diamond birthday, actually look like, out of their covers. Hector Barjot is speaking in French, but after the Intro, he is just showing us each of the records. They are absolutely GORGEOUS!! This makes me want to buy them, now, even though I have nothing to play them on. We know a lot of you are anxious for information about where you can see “Thriller 3D in IMAX.” The short film will be shown in all 400+ IMAX theaters in the United States. “Thriller 3D in IMAX” will also be shown in select theaters in Canada and the United Kingdom starting on September 21. For those of you in the US, UK, or Canada, you can head to http://imax.com/thriller3D to find a theater near you and buy tickets. “Thriller 3D in IMAX” will also be shown in select markets in the Middle East and Latin America before The House with a Clock in its Walls, so the dates of the showings are dependent on when that film opens in those countries. Sunday (Dec. 2) marks 35 years since the debut of Michael Jackson’s ground-breaking “Thriller” music video, which premiered on MTV and launched a dance craze, a red-jacket fashion favorite, and more pricey and ambitious videos by other top-tier artists. The 14-minute “short film,” as the late singer preferred to call it, was shot on 35mm in downtown Los Angeles in the middle of the night. It was directed John Landis (National Lampoon’s Animal House, The Blues Brothers, An American Werewolf in London), and written by Landis and Jackson. The title-track from Jackson’s 1982 album was written by Rod Temperton and produced by Quincy Jones, and became the seventh single after such hits as “Billie Jean” and “Beat It.” The landmark film went on to win three MTV Awards, two American Music Awards and a Grammy, and is the first and only music video to be inducted into the National Film Registry by the Library of Congress. The 3D version of the music video and restored documentary Making Michael Jackson’s Thriller, directed by Jerry Kramer, premiered at the Venice Film Festival in 2017. This September, it became the first music video released in IMAX 3D. The song re-entered the Hot 100 on Nov. 10, 2018 at No. 31, the highest it has been since April 7, 1984. Billboard spoke with John Landis, and entertainment lawyer John Branca, who brokered the deal with MTV and Showtime and is now co-executor of Michael Jackson’s Estate, about getting the $1 million to make the music video, its impact on the business, stealing the tracks from Quincy Jones without his knowledge and more. That was pretty ballsy to go to a television station to try and cover the costs of making a music video. John Branca: At the time, most music videos cost about $50,000 [to make], and Michael and John Landis had a budget of $1.2 [million] for this project, and the record company refused to pay for it, for good reason [laughs]. So I said to Michael, “You know, it’s a million two?” and he basically said, “Branca, figure it out.” So I came up with the idea for a “making of,” a long-form, 60-minute piece. It was the first time MTV ever paid for a video, and Showtime paid for it, their sister station, and then we put it out with Vestron [Video] and we actually ended up making a profit. What do you remember about the time on set and the amazing masks and prosthetics? Branca: At that time, I was Michael’s main business advisor/manager and so I really focused on the business. Now, when running the estate, I have to do the creative also, but at that time Michael and Landis did all the creative. The one thing that I did do -- because growing up as a boy, I loved monster movies, so Werewolf, Lon Chaney, Dracula, Bela Lugosi, Boris Karloff, Frankenstein -- when Michael felt pressure from the church, from Jehovah’s Witnesses, he told me to get the film canisters and destroy them, before the “Thriller” video was ever released. So I held them in my office for many, many days and he would call everyday. To destroy the whole thing? Branca: No. Who knows? So I said, “We’ll put a disclaimer on it.” That’s why you’ll see the disclaimer [at the start of the music video] that due to his personal convictions it doesn’t reflect Michael’s personal views. John, Michael called you because he was a fan of your film An American Werewolf In London? John Landis: Everything in Making Michael Jackson's Thriller is accurate. Good thing he wasn’t a fan of Animal House or we’d be having a much different conversation. Landis: He wanted to turn into a monster, and the first discussion with [special effects make-up creator] Rick Baker, he wanted to turn into the werewolf from An American Werewolf in London, and it took me a while to talk him out of it because I was saying it’d be really hard to dance with four legs, you know. That’s why he became that Werecat thing, because I suggested the werewolf from I Was a Teenage Werewolf, [starring] Michael Landon, in the letterman’s jacket. Rick’s first design, which was great, was too ugly. I said, “Look, it’s Michael. He can’t be ugly.” I think what he made was very elegant, that sort of cat creature. Landis: Oh, it’s scary. It’s meant to be scary. Right from the start you weren’t interested in making a music video. You wanted it to be elaborate. Landis: Music videos at that time were always just needle drop. Some were pretty good, but most were not, and they were commercials. Michael’s such a huge star that I said, “Maybe I can bring back the theatrical short.” I pitched him the idea, and he totally went for it. Michael was extremely enthusiastic because he wanted to make movies. What did you both notice after “Thriller” came out? Record companies probably weren’t very “thrilled” with you because all the other big artists probably wanted to make million dollar videos. Branca: They were thrilled, actually. Landis: You have to remember, nobody wanted it. We had to figure out a way to finance it because it was a union shoot in Los Angeles. I demanded the dancers had at least a week’s rehearsal, all that make-up, so it was expensive. CBS Records basically said, “[The album has] been No. 1 for over a year. We made 'Billie Jean’ and ‘Beat It,’ with [directors] Steve Barron and Bob Giraldi [respectively] -- hugely influential important videos, which cost very little, and you’re coming to us? You already have the most successful album of all time, and now you want to do this vanity video so you can turn him into a monster? Go f--k yourselves," was essentially what they said it to me. They didn’t say it to Michael, but that was the same thing. So we had to figure out a way to make it, which is why Making Michael Jackson's Thriller was done, so we’d have an hour and we could sell the hour. Do you know what happened when the video “Thriller” came out on TV? The No. 1 selling album in the world, already out for a year, tripled its sales. So everybody jumped on the bandwagon. Branca: It changed the way people make music videos. Landis: It raised the standard. Everybody became much more ambitious, and tons of big directors came out of music videos. Branca: “Thriller” remains the most influential and most important video of all time. Everybody’s acknowledged it, so kudos to John. Landis: It’s always called those things and I don’t make those claims, but it certainly had a huge impact not only on the music business -- and it made MTV. Their viewership went nuts. As a filmmaker and someone who’s just had the sound quality and visual presentation of the “Thriller” video upped [in 3D and Dolby Atmos], how does it make you feel that people today watch videos on YouTube, on computer and phone screens? Landis: I’m not crazy about it. Branca: You should talk about the sound. Landis: The sound. Okay. “Thriller” was just stereo, left and right. The soundtrack for Thriller, I said, “This is a movie; this is not a rock video.” Rock videos are always needle drop. A record at that time was mixed to sound good on your car radio, so, I said, “This is a movie.” So I asked Quincy Jones and Bruce Swedien, “Can I have the tracks to ‘Thriller’?” They both said no. I explained to Michael we needed them. So George Folsey and I and Michael, at like 2 in the morning, went to the recording studio, walked in the lobby, the guard, said, “Hello Mr. Jackson.” “Hello.” We went in the back, found the tracks on the racks, took all of them -- there were a lot -- put them in two big duffel bags, put them in the trunk in a car, drove them over the hill [to the engineer], where they [duplicated] them all. We put them back in the duffel bags, went back with Michael over the hill, and put them back [laughs]. I’ve always been amazed that Bruce Swedien and Quincy have never said anything because "Thriller" is very different than the record. I only used a third of the lyrics. It’s a 3-minute song; in the film, it plays for 11 minutes. Well now, through new technology called Atmos, you can put sound anywhere in the house. It’s amazing: I had to relearn that because music is always left-right-center, and suddenly how the f--k do you mix this because its everywhere. But we were able to bring it up and it’s astounding. That story should have been in the documentary. Branca: Quincy said you’re not allowed to remix his tracks ever without his permission, so be careful. 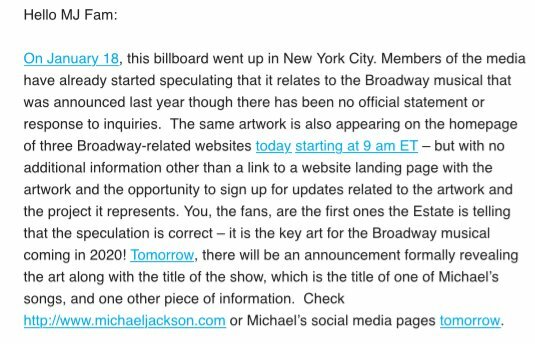 Email from the Estate of Michael Jackson (this image in NYC is advertising for the upcoming Broadway show based on Michael's life). As we all know, the past few weeks have been very difficult for both the Estate and Michael’s worldwide fan community. As we have communicated with many of you personally, you know that there is a significant amount of work going on behind the scenes at the Estate that is not visible to the public in order to address the spurious accusations made in Leaving Neverland and protect Michael’s legacy moving forward. In the past few days, several of you have written to us about an absurd and obscene article that appeared this week in RadarOnline. RadarOnline is, of course, nothing more than an entertainment site existing to appeal to the most base instincts of humanity, and is barely worthy of the designation of tabloid. However, since they published their absurd story, the Estate’s attorneys have sent the publishers this response. We hope this will allay some of the concerns you have expressed over the last few days. The text of the letter may be read here. Furthermore, we wanted to share the text of the letter that was recently sent by the Estate's attorneys to HBO. It may be read at The Hollywood Reporter. When we first learned of Leaving Neverland on January 9 it was inconceivable to us, as it must have been to you, that a respected company like HBO was behind it. We assumed that HBO’s corporate values reflect a commitment to fairness, honesty and integrity. Sadly, we were wrong. Leaving Neverland is nothing short of a premeditated ambush, announced at the 11th hour at the Sundance Film Festival as part of a secretive two-year deception to escape scrutiny from Michael’s family, Estate, friends, associates and fans. HBO even tried to hide the names of the two accusers in announcing the film, only begrudgingly identifying them after our initial public statement revealed them to be two failed litigants we know well. HBO’s goal is obvious: It wants to mute the voices of all who would speak up in defense of Michael Jackson and who know the lack of credibility of these allegations as well as the character of the individuals making them. Thanks to all of you, HBO and its filmmaker have been unable to prevent the harsh light they hoped to avoid from being directed at this film. They do not want anyone noting that it is overwhelmingly one-sided. They do not want it known that the filmmaker, in two years, never so much as reached out to anyone other than his two subjects and their families, including those he maligned and was morally and ethically obligated to contact. Nor does HBO want anyone knowing that the subjects have repeatedly changed their stories, committed perjury and have financial motives hidden from the public. Rather, HBO hopes to sneak Leaving Neverland by any rigorous scrutiny of facts and credibility that it should have demanded of its filmmaker. But your tenacious passion to defend Michael in the face of such dishonesty pierced HBO’s lack of transparency. It is inspiring and heartwarming, and we are grateful to all of you. Most important, HBO and its partner Channel 4, want to deflect attention from the fact that it is attacking an innocent man who is no longer with us to defend himself and that they can do this only because they cannot be held legally responsible for defaming a deceased person. The refrain from HBO continues to be that fairness is irrelevant while adding the disingenuous and absurd claim that its film is not about Michael Jackson. Let’s be clear: it is entirely about Michael Jackson. The same Michael Jackson who had his day in court on accusations just like these 14 years ago and was declared innocent unanimously on all counts by a sophisticated jury. But in HBO’s court, there is no jury, no opportunity to cross examine witnesses and no defense; just a predetermined conviction of an innocent man by an intentionally lurid filmmaker who declared himself the final judge and jury. And rather than let viewers weigh all the evidence and decide for themselves if the subjects are telling the truth or lying, HBO forces the filmmaker’s storyline down every viewer’s throat, allowing no time in four hours of viewing for even a scintilla of the volumes of conflicting evidence. Sadly, his children have had to repeatedly endure the additional pain of these lurid tabloid tales after losing their father, be it during the criminal trial of the man responsible for his death or the claims of the two individuals in this film. While the press has treated the allegations in this film as fresh and new, in truth these individuals have been making these same salacious and false accusations in the media for six years, more than half of the time Michael has been deceased. But having hijacked HBO’s credibility, what they have now is just a louder platform, a soundtrack, drone shots, skillful editing and a multimillion-dollar marketing budget. What they can’t buy is the truth. Facts don’t lie; people do. Leaving Neverland goes out of its way to hide. Finally, it’s important to remember what Michael said himself in 1994 when he was invited to the NAACP Image Awards. At that time, the relentless persecution that would haunt him the rest of his life had started. In addressing the gathering, he went out of his way to note the right all of us have to the presumption of innocence. Alicia what about re-running the take2 and helping Taj get a documentary with all the stars/celebs who knows him, like Macauley etc. Tell the world what he used to do for all the underprivildged kids, dying kids etc. Help he gave to lots of people and saying that they where not just boys! Michael had a gf , she came out to see us outside his hotel in London. Tell everybody how kind he was with fans, like buying us all pizzas once the press had left and laughing about it!! Also paying for us to have drinks which we all shared. The man was a big kid. Where is the harm in that. Oh yes of course He did not comply! And neither will the estate to these 2 liars when they wanted money!